I'm going to talk about something that happened at church Sunday, I rarely discuss my religion on the blog and I'm not really going to start today... but I needed to explain how I was emotionally touched and it came from a lesson there. It was about how we needed to listen and follow a certain path if we really wanted to be happy. I knew what they meant but it brought up emotions that I wasn't able to deal with as well as I had hoped... I broke down crying. I wanted to share my feelings with the other ladies there but I wondered if it would be too much for them. I was dealing with the aftermath of my trials and my choices ended up having me fall deeper into darkness. There would be times I would have some clarity here and there, where I'd turn things around but none of them were real life changes as the next trial that would come along, I would fall back into old patterns. I don't think most people knew how far I fell... it wasn't pretty, there were times I was out of control, so out of control... I couldn't even admit it to myself. It wasn't until this Christmas past that I gained a clarity that I had not felt for many years, where I came to understand that I could not continue on those paths... as I knew that no matter how hard I tried to cover the pain, it wasn't working anymore. With that clarity came more trials then even I thought possible ... there has been incredible opposition but I knew this would happen as I can I see the trials for what they are and I am making other choices... ones that don't involve hurting myself anymore ... choices that are helping me to see even more clearly. I remembered of course that I'm just human, I made mistakes, I will make more... ones that are hard to live with, ones that formed my future and although I can move forward and make better choices which I plan to and I have... I still have to live with the choices from the past. Don't get me wrong, I do believe in true forgiveness and I have forgiven myself for the poor choices I made... most of them out of sheer sadness and depression... some made because I was beyond exhausted from lack of sleep and I knew of no other way at the time. Regardless of the reasons, I understand I was a hostage to my choices and that even though I had once thought I was free because I could make them, I was actually more unhappy because of them... Changing those choices brought me a freedom I needed. The choices we make go a long in determining how our perspectives in life turn out to be. We always have a choice...thanks for the reminder! Ciao, carissima Launna, mi piace come scrivi, nice post!!! Great post, è bello venirti a salutare nel tuo blog!!! Buon giovedì e a presto.Buon Lavoro!!! Love the title.. Yes life is full of choices.. Thanks for sharing! It's so awesome we serve a God who not only forgives are bad choices but is accepting of us the way we are, then from there he changes and molds us into the person he planned us to be. You know Launna, sometimes sharing is very hard. However, you never know how by sharing a personal experience you may be helping someone indirectly. I liked the honesty in this post. Hey Luanna, we all make mistakes. I continue to stumble occasionally, but that's only humane. The trick, I've come to understand is what I do when I mess up. Dear, Launna, I think that all the choices we made have a great influence on our lives, but we can make new choices every day. I'm happy you now feel free. The best is yet to come. Yes, you ALWAYS have a choice. But that doesn't mean that we can't forgive ourselves for bad choices that we made in the past. After all, we always have the choice to do better in the future. I think I understood what you wrote about - yet I believe we shouldn't fear making choices! Making good choices can be hard at times because it takes changing our old perspectives to get diffferent positive outcomes. Remembering your goals helps so much when you feel like you are going to fall into old negative patterens. Hope it gets easier anf better for you day by day. Gorgeous. 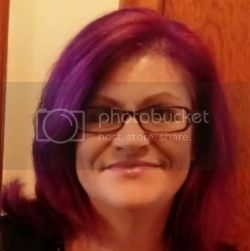 Gorgeous post, Launna! You always have a choice! Just remember we are our own worst enemy and a much harsher critic of ourselves than others are of us. You have amazing inner strength -- keep going! hope it is a great weekend -- and maybe even a little warmer! I think you said a beautiful thing: we must forgive ourselves. We all make mistakes, but we all deserve to be happy. I'm glad you felt this emotion last Sunday (Church is a magic place for me). You are a beautiful person, please remember this always. Thought provoking. I can relate. We sometimes do things without thinking but it still was a choice. Even so, we must live with that choice. It's better to learn from it than sit back & dwell on it. Don't let past mistakes cripple you, you are not your mistake. Remember no one on earth is perfect, learn from your mistakes and let it go so you can be certain it never happens again. Good day Launna! I wish you had felt comfortable to reach out to someone at church. You can't be the judge of what is too much for someone to handle. With that thought you are being too hard on yourself. You deserve any opportunity to talk to someone. You never know, that one person might just be your angel. I have made some bad choices but I refuse to let them steer my life. 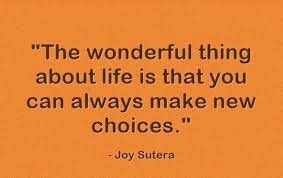 It's good to remember that we can always make our situation better by making better choices. It's always great to read you, Launna! I have made some not so good choices in my life, but I have moved on and do my best to not let my past choices and events govern my present moment. I try to live in the moment and enjoy the time, things and people that are in my life in the here and now. Hi my dear Launna:). Ox. I am so sorry to hear that you've broke down at church and it must been hit you at the right spot:). When I'm at church I always a person who broke down easily no matter what reason I can easily cry just seeing other people in pain and listen to their stories. I'm a a sensitive person:). If I was there with you I probably crying with you:). Life is all about choice making and everyday of our lives is always some decision for us to make which way we want to walk through. Hope some snow's moutain is melting down:) over there Launna. How have you been this week? I'm super busy - meeting and meeting:). I'm picking up even more busy with our family moving! I'm not looking to that a millions boxes packing:). Have a lovely weekend to you:). We all must learn from our mistakes.... you are so strong Launna, and I love your positive attitude! You are so real!!! Thamks for sharing with us your experience!!!! I'm happy you have identify your darkness and are working towards getting out of it. Happy weekend!! You need to have a good cry sometimes and let it out - you let out so much more than you think! Always come back for more inspiration. Your blog is so motivational! Thank you! The best thing we can do when we realize we've made some bad choices is to acknowledge them, forgive ourselves, and move on. I believe every path we take, whether it's the "right" one, a detour, or a dead end is a path worth exploring, because altogether, those paths and decisions teach us about the kind of person we want to be. Am loving the quotes you have on this post,they have a really great message so as your post. The first quote...that certainly is wonderful, isn’t it? That even though we may have made wrong choices in the past, we all get a new day to forgive, to make changes in the world, to become a better person. I realize how fortunate I am to have a life….no matter the arising conflicts, there is still so much beauty in the world, so many things for me to be thankful for. I’m so sorry for what you have gone through, Launna. I can scarcely imagine it, what it must have felt like to have fallen like that…. It’s true that although we get new chances each day, we still have to live with the effect of the choices we’ve made in the past. It’s not something that can just be erased, but that’s the beauty in it all, I think. There are choices that we regret, choices that can haunt us in the future. But then there are choices that we make to change things around, to be at peace within ourselves. It shows truly how much we’ve grown as people, and that no matter the circumstances, if we really do believe in something, we can get things done. It isn’t easy, life. We make good choices, we make horrible mistakes. But at the end of the day, it’s really how you are going to continue to approach things from the lessons you’ve learned, from the journeys you’ve endured. I generally don't blame myself too much for bad choices. I justify it by saying it was the best I could do or all I knew at the time...and I know that at times of being extremely depressed I can't hold myself to a particularly high standard. What I struggle with is to break the cycle of bad choices and to change- depression just keeps you stuck for years and years on end. I guess I would say, that making good or bad choices is all part of the path we take in life. It all depends on how we actually react to the bad path. Do we just say, yes we made a mistake and fix it? Or do we curl up in a ball and fall into depression about it? Choices is what makes us free and independant, and what gives us life experiences to be able to tell others what might happen if they make the same mistake. Then it's up to that person to avoid it, or go for it. Nice post Launna, and thanks for the message which I will respond to soon. Great post Launna...great insight. You are an inspiration Girl. Have an amazing weekend. Sending you a ton of hugs. Hind sight is pretty clear, but unfortunately we have to make those mistakes first before we can see that. Great post, Launna! Bello post, siempre hay como tomar nuevas decisiones para ir por el buen camino. A very thought provoking post :) Nicely written ! Those quotes are awesome. 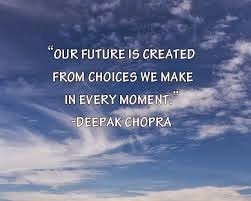 We have to be careful with the choices however minor that we make each moment. Those who have understood how to do it early enough in life become contented and happy eventually. I can so painfully relate to this, but I am glad that we almost always have the choice to make things better and you are making that choice. Your posts are always really great and beautiful! 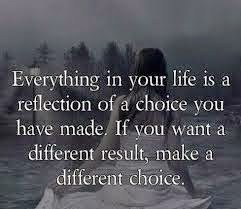 It is hard to reflect on the choices we've made, especially..when all we can see is the rut we are in. Beautiful post! Mistakes are there to remind us to be wiser in making our next choices. I'm happy that you're getting there Launna. An inspiring post, thanks for sharing. You are a wise and strong girl who have given so much thought to things you do now and have done in the past. I wish that I was there when in the church ( of all places) you felt that you could break down. However I am so happy and proud that you were able to pick up and become strong all over again. You are an inspiration to a lot of us. Great post. The great thing is that we can make new choices all the time. I agree with you that it is important to forgive ourselves for some of the choices we are not proud of because we really need to understand what caused us to make those choices It sounds like you are being very reflective and that is helping you to make better choices. Keep up the wonderful work. Have a beautiful week! You are strong women ! !